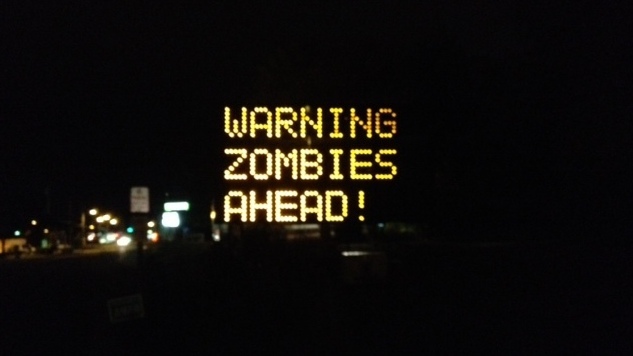 Drivers may have gotten a chuckle out of an electronic message board in Maine warning of zombies, but city officials were not amused. A Portland, Maine road sign is changed to a zombie warning on Wednesday, Oct. 10, 2012. It originally read "Night work 8 pm-6 am. Expect delays." An electronic message board that typically warns motorists about impending roadwork instead read: "Warning Zombies Ahead!" as shown. City spokeswoman Nicole Clegg says the signs are a safety precaution and changing it could have led to driver distraction. She tells The Portland Press Herald tampering with a safety device is a misdemeanor punishable by up to a year in jail and a $1,000 fine.